Pelage: not known but probably coarse and sparse,similar to modern capybara. Teeth: lower incisors more compressed than in living capybara. Locomotion: Similar anatomy to living capybara implies non-specialized but good swimming ability as well as walking, and occasional trotting, gallopping. Social Groups: assumed to be gregarious. Predators: most likely medium to large extinct and dogs, teratorns, anaconda. An extinct Ice Age capybara, species undetermined, has been discovered in Southern California from 200,000 year-old lake sediments. Several other water-loving animals including tapir, pond turtle, frog, and water birds were discovered in nearby rocks of the same age. Together these fossils indicate a wet habitat there at that time. 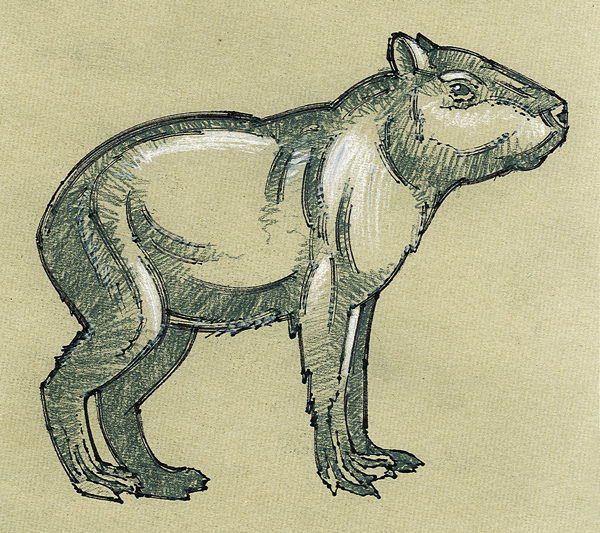 How to cite: Extinct Pinckney's Capybara (Neochoerus pinchkneyi) Fact Sheet. c2009. San Diego (CA): San Diego Zoo Global; [accessed YYYY Mmm dd]. http://ielc.libguides.com/sdzg/factsheets/ extinctpinckeyscapybara.